HTC One M9 review | What Hi-Fi? The HTC One (M8) may not have had the catchiest name, but it was one of our favourites of all the smartphone heavyweights last year, winning us over with a stunning design, an excellent Android experience and a screen that made watching movies on the go a joy. However, it was not without its flaws, notably HTC’s much-maligned Ultrapixel sensor and the gimmicky Duo Camera, the One (M8)’s Achilles’ heel. Now it’s time for the One M9 - without the brackets this time - to take to the stage. It has a new camera to boot, not to mention a powerful new processor, updated user interface and high-res music support. But can it deliver the stellar One performance we’ve been waiting for? When it comes to design, it’s business as usual. Samsung and LG have experimented by adopting glass, metal and leather, but HTC is clearly keen to keep one foot in charted territory. HTC says it took inspiration for the design of the M9 from watch and jewellery manufacturers, but ultimately the result is a combination of the best bits from the M7 and M8, rolled into one. The machined aluminium body for which HTC’s flagship One series is renowned returns, but the curved edges that melted into the screen of the M8 instead get a more angular design, like we saw in the M7. HTC has made a bold design statement by adding accents to the edges. The stand-out colour is the two-tone light silver with gold trim, but it also comes in gunmetal grey and gold, each with mirrored trims. The idea is to create something that’s easier to hold and grip, with the curvature of the back panel also reduced slightly to help it sit in your hand easier. The bezels are slimmer than before, though the Boomsound speakers still flank the top and bottom edges, and the phone's corners are ever so slightly less curved to match the more angular design. Buttons run along the right hand side of the phone, including the power button, which has been moved here from the top of the handset. It might be easier to reach, but the close proximity to the volume buttons can be confusing. That small niggle aside, the M9 still looks as premium as ever. It's arguably not as sleek as the M8, with those angular edges giving it a slightly rough feel, but it does make it easier to grip in comparison. It also looks a little chunkier in the body, though in reality there is very little in it – the M9 is 9.6mm thick, against 9.4mm for the M8. The One M9 remains the best-looking Android phone on the market, and is still one of the most desirable. If you're someone who values premium design, we challenge you not to want to give the One M9 a try. Rather than jumping on the Quad HD bandwagon with the likes of the Samsung Galaxy S6 and LG G4, HTC has stuck with a 5in Full HD display. That’s not necessarily a bad thing – a QHD screen doesn’t guarantee better results. That’s not necessarily a bad thing – a 2K display doesn’t automatically mean it’ll be better and we don’t find ourselves missing it here. There are no discernible pixels and the screen is super sharp whether you’re flicking through menus or watching a video. Outlines are cleanly cut, textures well realised and text on webpages clear and well etched. There’s a cooler colour balance here than on the likes of the iPhone 6, and even its predecessor, but it never feels lifeless or dull. Colours are pretty true to life, with reds and greens looking a touch more realistic – if somewhat less vibrant – than on the iPhone. Viewing angles are good, but contrast is the one weak point here – it’s not as dynamic as the Samsung Galaxy S6, LG G4 or Apple iPhone 6. Whites fail to pop in dark scenes with quite so much gusto. Blacks will go suitably dark though, if not to the inky depths of AMOLED displays, but in exchange, you do get a more accurate white balance, bright and clean without the bluey tinge often viewed in Samsung’s phones. Despite not pushing forward with its screen technology this year, HTC’s One M9 remains a fine option for watching movies on the go. The original HTC One M7 showed how serious HTC is about audio, with its front-facing stereo speakers blowing competitors out of the water. The M9 takes that a step further by introducing high-res music support (up to 24-bit/192kHz) and a brand new equaliser with Dolby Audio sound processing. This kicks in for listening both through headphones and the Boomsound speakers. Previous Boomsound equalisers haven’t made the grade for us, but the Dolby effect is subtle, without being overpowering. It boosts volume and creates a slightly wider, richer presentation without affecting the tonal balance. With headphones, the equaliser helps make the M9 an enthusiastic, upfront listen. Detail levels are good and the M9 times pretty well too, showing improvements on the M8, though not flowing quite as effortlessly as the iPhone. If you’re listening to classical music, the Dolby equaliser can lead to a slight loss of subtlety, so we’d opt to switch it off here. However, for pop, rock or hip hop it can certainly make some valid improvements to your music on the move. Feed the M9 a well-mastered hi-res track and the difference is apparent. Everything tightens up and there is more in the way of coordination and subtlety. We’d still pick the iPhone 6 or the Samsung Galaxy S6 for refinement, but the HTC One M9 holds its own. The front-facing stereo speakers that debuted with the M7 return, and they sound louder and clearer than ever. They’re richer and more direct than any other phone speakers on the market, and make watching a movie without headphones a distinct possibility. There’s an option to choose between Dolby’s Theatre and Music modes when listening to the Boomsound speakers, but we preferred the latter no matter what we were doing. The Music mode appears to boost the bass slightly, with Theatre boosting the treble. We found that mode introduced hard edges to dialogue and made the overall sound a little less enjoyable to listen to over long periods, but it’s worth experimenting to see what works best for you. The HTC One M9 features Qualcomm’s newest octo-core Snapdragon 810 processor (four cores clocked at 2GHZ, four clocked at 1.5GHz), with 3GB RAM to support it – a first for an HTC phone. That’s a similar chipset to that running the new Sony Xperia Z4 Tablet, and we haven’t been disappointed. The One M9 is super responsive, and didn’t struggle with any task we threw at it. Flicking through menus is slick and smooth, while apps and webpages load without a stutter. It’s a faultless performance and one that really trumps last year’s flagship handsets when it comes to loading graphic-intensive games or taking on lots of multitasking. The phone will come with 32GB of on board storage with a microSD card slot for expansion (up to 128GB) and 100GB of Google Drive storage for two years. Despite shaving a few millimetres off its elder sibling, the One M9 manages to squeeze in a bigger 2840mAh battery. Unfortunately, its battery life failed to impress in both our standard battery rundown tests and real life use. Medium usage would see you through 9 to 10 hours – just enough for a full working day. But add in a lengthy commute and it’s likely to be much less. Our battery rundown test, looping a 720p video and half brightness with wi-fi on, saw the One M9 conking out at 7 hours 26 minutes, almost half the near-on 14 hours the Z3 managed with its slightly bigger battery. There is some good news, though; employing the battery saving modes will help improve this. The camera on the HTC One family has always been its Achilles’ heel against the best of its competitors. Its Ultrapixel camera, which claimed to offer better snaps in lower light due to bigger pixels, wasn’t as well realised as hoped, with the downside being that pictures in good light suffered from a lack of detail. For the M9, HTC has moved the low-light-killing Ultrapixel lens to the front of the phone and replaced the main camera with a 20.7MP f/2.2 snapper and dual LED flash for more detailed, sharper snaps. It’s better than before, but the camera remains the HTC One M9’s weak point. It captures much more detail than the M8 did and can produce fine, sharp shots in good light, with colours well judged and noise kept at bay. We’ve no doubt that you’ll be pleased with the results, but there are still cameras with lesser pixel counts that can deliver more detailed pictures. However, give the M9 tricky conditions to deal with and it starts to struggle – particularly in bright light. Autofocus doesn’t always pick out the subject correctly, leading to the background becoming overexposed as a result. Unlike the iPhone 6’s automatic HDR mode, on the M9 you have to select it from a menu. Forget to activate HDR and you’ll notice a fight between the light and dark elements of your picture, with the darker areas losing detail. The HDR mode isn’t foolproof either. Though it does a great job of lifting darker areas out of the shadows and brightening them significantly, we noticed that highlights in the picture could be overblown as a result. Low light snaps aren’t a strong point for the M9 either, but that’s where the Ultrapixel camera comes in. The Ultrapixel camera fares much better in its new position as the front-facing cam and blows the competition out of the water when it comes to bright, clear selfies in low light. The results aren’t quite noise free, but they are significantly cleaner than the pictures we got from the likes of the iPhone 6. Video calls benefit from the f/2.0 lens too, and 4K video is possible using the main camera, with the ability to record up to six minutes of footage at any one time. The lack of optical image stabilisation does mean it can be a little jerky on playback and we found some of the same niggles with exposure as with stills, but for quick videos you should find it serves you perfectly well. While the camera interface has been somewhat stripped back, there are still plenty of options for manual tweaking and editing, plus plenty of new filters and effects to play around with. As far as mobile snappers go, the HTC One M9 trails far behind the LG G4’s stunning offering. The HTC One M9 debuts HTC’s Sense 7 interface, based on Android Lollipop and offering much more customisation to the look and feel of the handset software. You can select from a number of pre-built themes, or even build your own using just a picture. The theme generator chooses a colour scheme, fonts, icons and sounds based on your snap. It is clever, but we preferred HTC’s themes on the whole. While this makes the overall look and feel of HTC’s Sense experience less memorable as an ‘HTC experience’, it allows greater user flexibility, mirroring the level of customisation available on a pure Android device. Aside from the new design, Sense 7 has increased awareness of situations and locations, via the optional Sense Home widget on your homescreen. It learns apps you might use at home, at work or out and about and places them on the lock screen, as well as suggesting ones you might find useful in the future. In the US, this expands into your Blinkfeed, which returns in Sense 7. This offers localised suggestions based on time and date, for example by recommending restaurants around lunchtime, but we’re yet to see that launch in the UK. The Dot View case launched with the M8 returns with the M9 but packs a number of tweaks, following feedback from its predecessor. This includes the option for a transparent back panel, to allow you to see the metal finish of the M9, as well as a more relaxed hinge to the cover so it can be folded back on itself more easily. The Dot View interface also offers a number of new options via the Dot View app, which allows you to play a number of simple games through the cover, as well as show scrolling display text among other options. Finally, HTC will be offering a pair of dual-driver headphones as an upgrade to the earphones included in the box. The HTC One M9 is a tale of two halves. Its premium design and top-notch build quality makes it a seriously desirable handset, not to mention its slick performance, flexible interface and superb Boomsound speakers. However, we can’t help but be disappointed with its camera and that less-than-ideal battery life, and while audio and video performances are good, they don’t quite top the best of its competitors. It’s with a touch of sadness that we have to dock the HTC One M9 a star for those reasons. There’s plenty to like here and indeed some improvements on its predecessor in some areas, but the M9 is evolutionary rather than revolutionary and we’re not quite sure HTC has done enough to compete. There is plenty to like about it, even if it clearly clings to the left of the evolution-revolution spectrum. 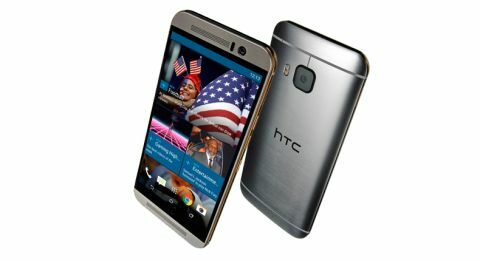 The problem is that the competition has moved on significantly and now outclasses the HTC in most respects. It’s good – but there are better smartphones for the money.